Once again, an awards luncheon to spotlight District 25 accomplishments! 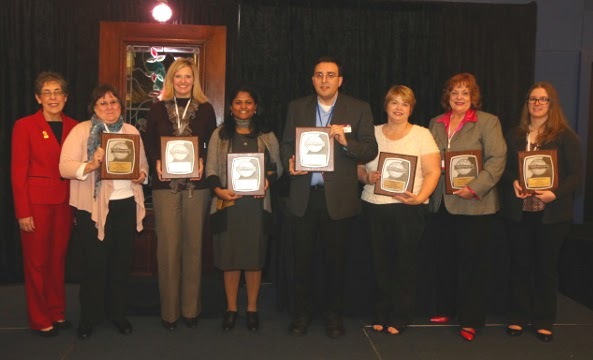 Many Toastmasters and clubs were recognized Saturday, November 15th at the 2014 District 25 Fall Conference. Our program was filled with the great accomplishments of our members. It is great to see one of your club officers receive this award! These outstanding officers are now listed in the D25 Hall of Fame! Recipient of the Communication and Leadership Award was Tracy Kornet, Emmy Award winning CBS News Anchor/Reporter. Tracy was unable to attend due to a relocation. It was an honor to be able to recognize her accomplishments in our area. What a great event! It took a team to put it together and we hope you all enjoyed the event. Previous Post LinkAnswering the Call for SpeechcraftNext Post LinkWhat a Great Finale to the 2014 Contest Season!